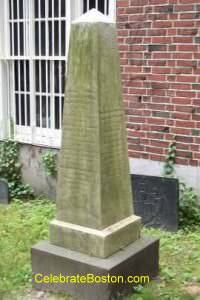 "Thomas Cushing, statesman, born in Boston, Massachusetts, March 24, 1725; died there, February 28, 1788. He was the son of a wealthy merchant, in whose counting-house Samuel Adams was for a short time employed. He fell under the influence of Adams, and presently became prominent among the popular leaders who were preparing the way for the Revolution. In May, 1766, he was elected to the Massachusetts assembly, and immediately afterward, when James Otis, who had been chosen speaker, was refused by Governor Bernard, Mr. Cushing was chosen speaker in his stead. He was Speaker of the House until 1774, and as such occupied, in the eyes of the British, a prominence greater than his abilities entitled him to. His signature was affixed, during all that time, to all public documents of the province, which made his name so copious that Dr. Samuel Johnson had said in his silly pamphlet, Taxation No Tyranny, 'One object of the Americans is said to adorn the brows of Cushing with a [crown].' And that Cushing was not fit for leadership, and on several occasions showed himself weak-kneed. In 1772, along with Hancock, he opposed the formation of Committees of Correspondence, and afterward refused to serve on one to which he had been appointed. At the same time he is described by John Adams as possessing a rare faculty for procuring secret intelligence, which made him useful to the patriot leaders. He was elected in June, 1774, to the first Continental Congress, and in February, 1775, to the second. He was one of those whom the King instructed General Gage, in April, 1775, to seize and send over to England, to be tried for treason. In July, 1775, when Massachusetts formed a new government, Mr. Cushing was chosen a member of the council. In the Continental Congress he opposed a Declaration of Independence, and consequently, in the third annual election of delegates, January 19, 1776, he did not receive a single vote, and Elbridge Gerry was elected instead. In 1783 and several following years he was Lieutenant-Governor of Massachusetts. He was a member of the convention, held in January and February, 1788, that ratified the Federal Constitution. Cushing was entombed at Granary Burying Ground in Boston. His marker is on the left side of the cemetery near Park Street Church.